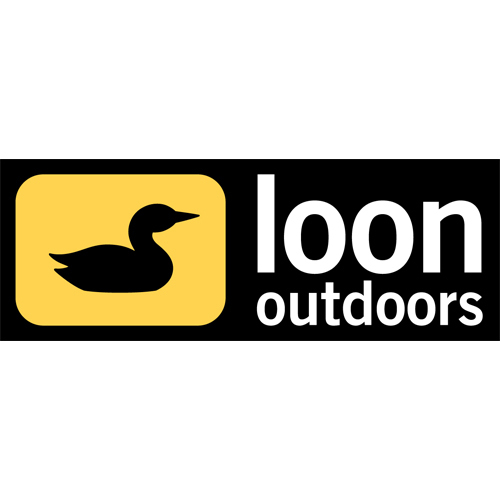 So its winter in Tassie at the moment, and all the trout fishing rivers are closed, there’s not much to do during the winter months apart from tie up a few flies or brave the snow and ice and head to the Great Lake for a flick. However there are a couple of other options for the fly angler, one of which is to jump on a plane and head to the tropics, which is what I did. 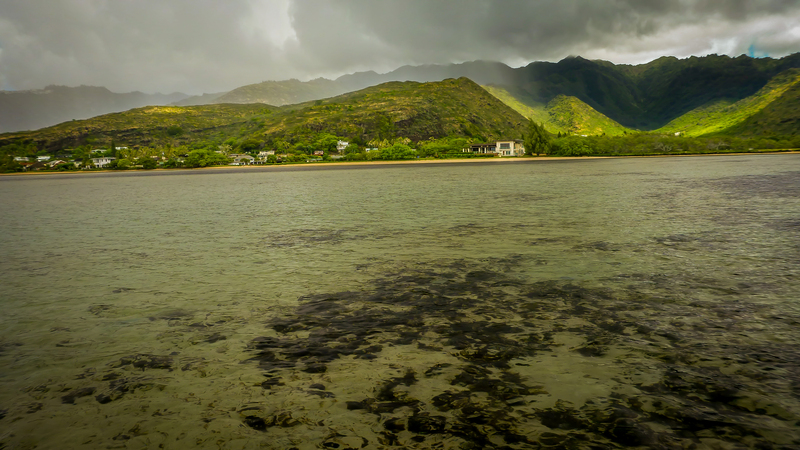 Hawaii doesn’t really receive much attention in the press as far as fly fishing destinations go, however over the last few years it has gained popularity with anglers, the target species is bonefish, and occasionally giant and bluefin trevally are also available. 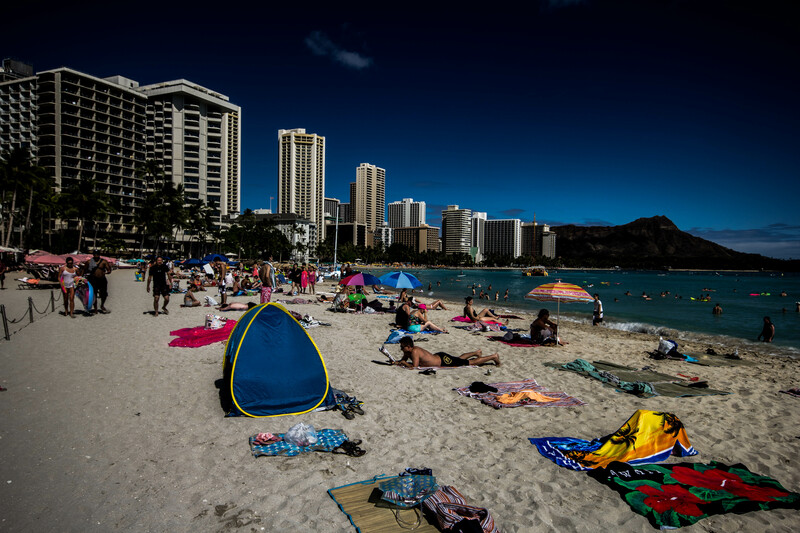 I had been to Hawaii once before a few years ago and knew that there were about 10km of good wadable flats from Diamond head (near Waikiki) to Koko head, I tried to find some accommodation in that area but come up with nothing, which lead me to a website called AirBnB, It has listings of people offering their houses, rooms or units for rent. It has a great map feature which lets you zoom to the area you want to stay in and it will list all the properties available along with there location on the map. I found a perfect little beach bungalow that was just a few minutes from the beach entrance, and it was smack bang in the middle of the 10km bonefish flat. The place I stayed at was called ALOHA STYLE COTTAGE by the BEACH! 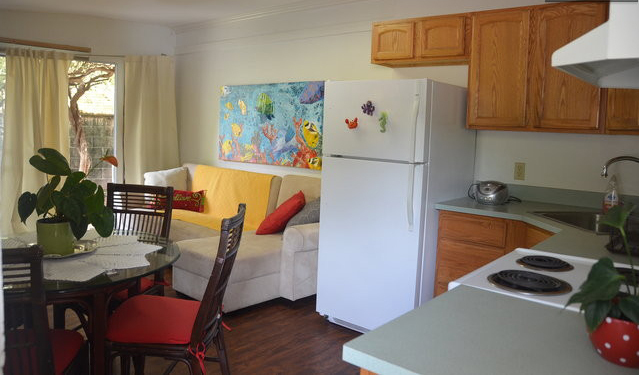 it had everything I needed, bed, shower, toilet, tv , fridge and a great kitchen with all the pots and pans needed to prepare the most exquisite dishes imaginable, which is what I did. Aloha Style Cottage by the Beach. Upon arrival I was greeted by owners Michele and Marcos they were extremely helpful with anything I needed. Michele is the founder and owner of Sun Yoga Hawaii, which is just near the shopping center and Marcos is a Nutritional Health Coach. I basically dumped all my gear in the room, set up my rod, grabbed my camera and was straight down to the beach for a look, not much happened for the first couple of hours, the tide was a bit low and the water was murky, it was also a bit overcast which made polaroiding hard, I did see a bit of action when something come in to the shallows and scattered the bait fish everywhere.. a few casts later and I was onto a baitfish, little trevally. 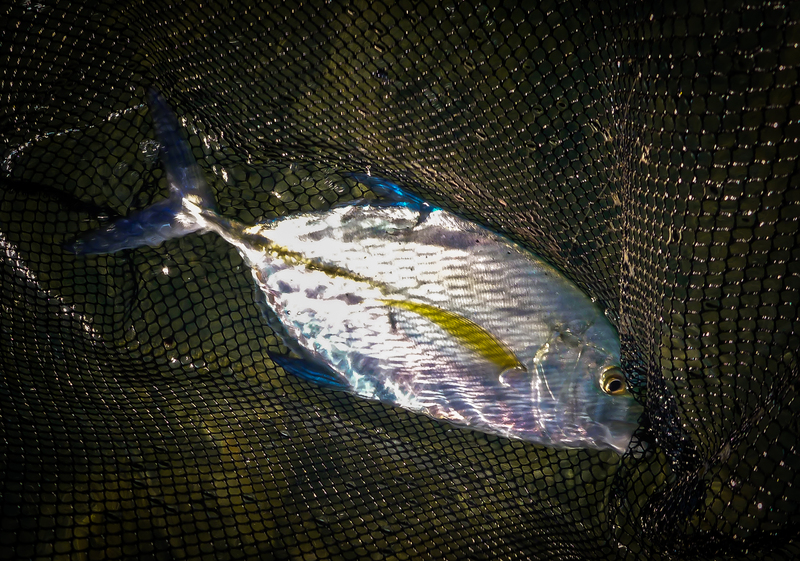 Little Trevally, possibly a bluefin. 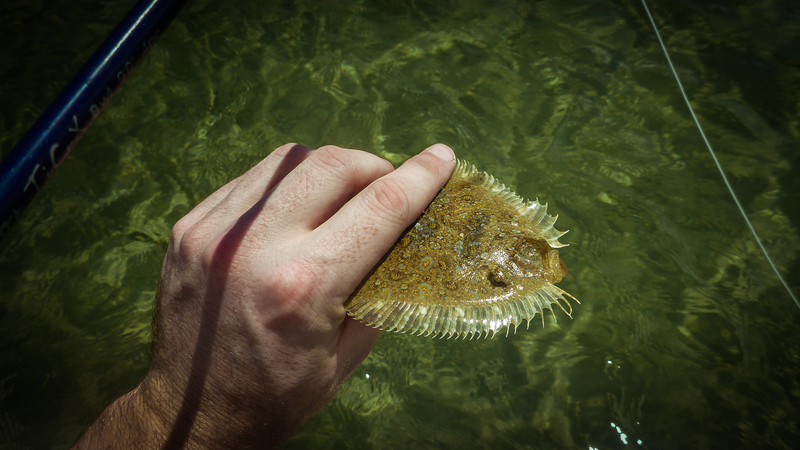 Later in the day I moved around to some deeper flats and hooked into a bone almost straight away, it was good to be on the board, I also caught a cornet fish, sole and some other little fish, and to top the afternoon off a turtle swam right up to me, which I thought was pretty cool, I had a good day. The following day I headed to a spot where I knew there would be a few bonefish cruising the edge of a deeper channel and I hooked a bone almost straight up, then very next cast hooked another one, as the bonefish was running off into the distance a tangle developed in the fly line and it shot out through the guides, I was lucky it didn’t take a guide with it, after the bonefish had tired I wound in the line until I could see the tangle coming back in, I didn’t want to wind it back through so I just wound it back in to the tip of the rod and tried to untangle it, the line went slack in the water and when i finally unraveled the tangle the sine was snagged on some coral and the bonefish had managed to free himself, which was slightly disappointed, but having said that i would have been even more disappointed if I had broke a guide off winding that tangle back through the guides, or worse yet snapping the rod. 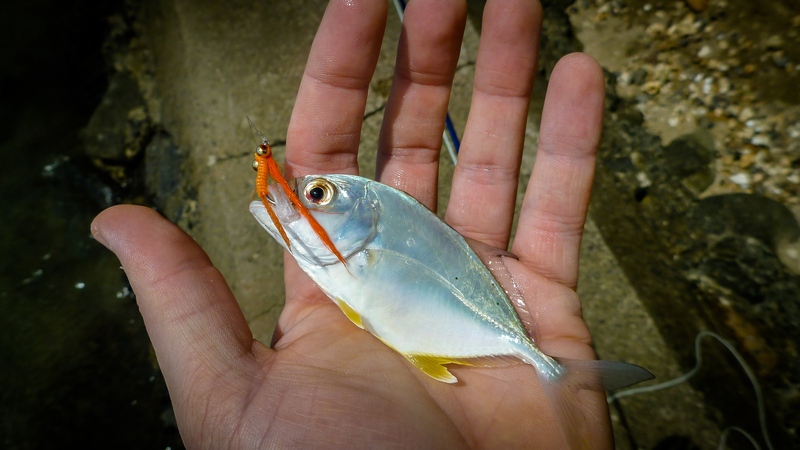 I caught a few cornet fish as I was heading back to the bungalow, I decided that I would head into Waikiki for a bit of a look around town and have a gander down at the main tourist beach aswell. I saw some nice bluefin trevally and schools of baitfish swimming around right on the main beach, it was pretty cool. This bloke was following me around one day all afternoon. 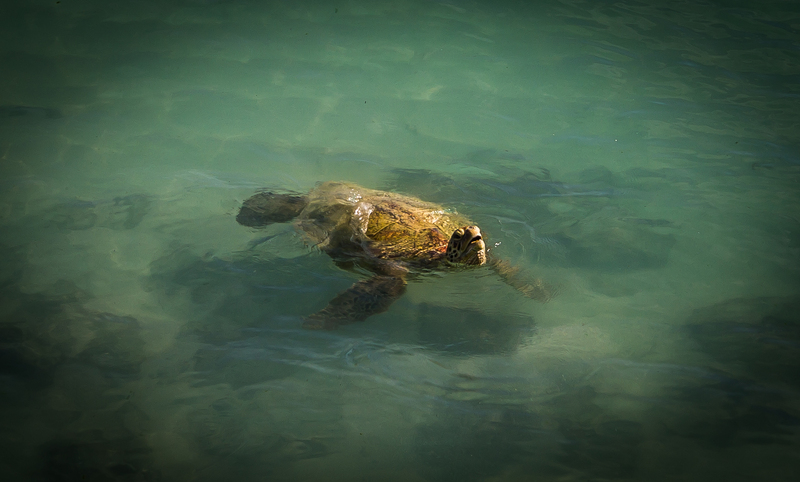 Waikiki Beach, Despite the crowds fish do come in occasionally. 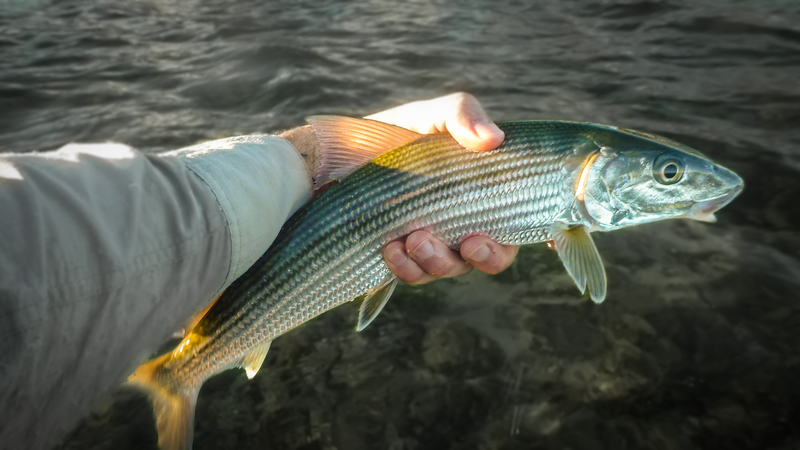 It was good to know that I could spot these large bonefish, make a cast and get them to eat the fly, I was pretty happy. Actually I was happy just to see these big bonefish swimming around. I fished my way back to the main park near where I stay, but had no luck, I did see quit a few fish but they were not in great positions to get a cast at, some were 50m away, some I walked right on top off before I even saw them, and the ones I did manage to get a cast at either didn’t see the fly or just spooked, but that’s bonefishing I guess. I decided to have a break from fishing and headed back to the B&B, I gave it a few hours before I went back down, This time I hooked into a bonefish almost straight away and I wanted to get a bit of footage of him so I tried to get the gopro out, but as I was stuffing around with it he made a run towards me and everything went slack and the hook come out. 10 minutes later a school of mullet were jumping out of the water, something was chasing them, so I shot a cast out and it landed right in the middle of where the action was, I started stripping as fast as I could and bang, a little blue fin trevally nailed the fly, I got him in and took a couple of pics and let him swim away, he was a beautiful fish, the colours on these fish are just awesome. 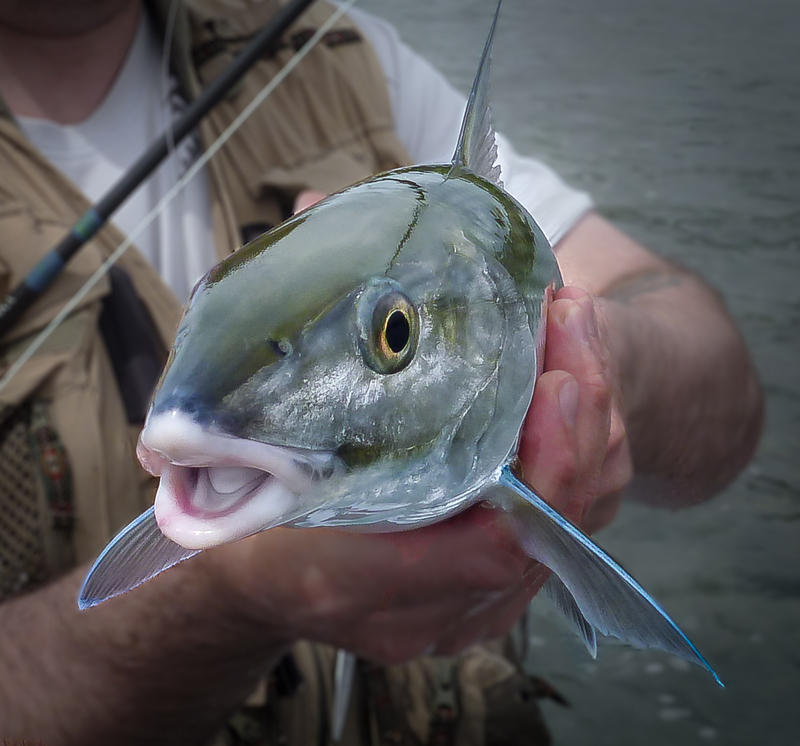 A very colorful Bluefin Trevally. On the penultimate day I awoke at 7.45am, I cooked some breakfast and got my gear sorted and headed to the flats, it was a pretty ordinary day weather wise, when I arrived at the prime location where I had previously spotted all the big bones it started to belt down with rain, and it was blowing a gale aswell. 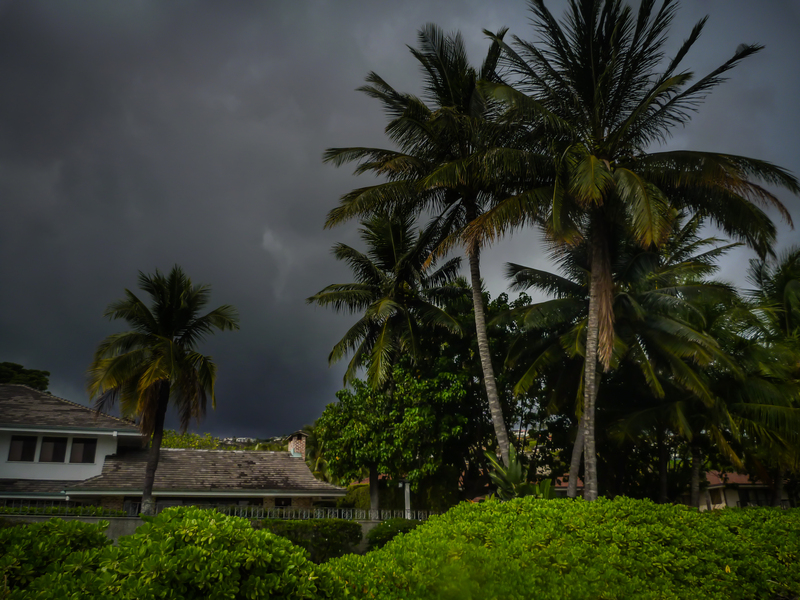 The weather was a bit of a worry!! I decided to waited it out, the rain eventually cleared however the wind was continuous for most of the day and the cloud just lingered over head blocking the sun which in turn reduced the effectiveness of my polarized glasses by about 75%, However I did manage to see a tail off in the distance but I never even got a cast at him, about 30 minutes later I spotted one cruising over a sandy bottom heading for a weed patch, I put a cast out, it landed about 15 foot in front of him and he swam straight over it, I twitched it a few times and nothing, I don’t know if he wasn’t interested or that he didn’t see it. I put another cast out just in front of him stripping slowing this time and he swam straight past it, he never spooked, maybe he just wasn’t feeding. but that was the only chance I had in the morning session. This flat had some good sized bonefish!! Later in the day I decided to head back out to what was becoming a very productive area for me, there was a sandy flat that also had some deep holes with channels running all around it, the bones seem to hang out there when the tide is high, and I have seen some bluefin trevally there a few times aswell over the last couple of days, I made a few blind casts into some really good looking areas and hooked into a nice bone, it was a nice fish and it went hard taking me well over 100m it was a great feeling, I captured a fair bit of it on the gopro camera which I was wearing at the time, you can check that out here. After releasing him 15 minutes later I hooked and landed a smaller version, I had about 2 in half an hour, I was pretty happy with that and as I was sorting my line out with the fly just dangling in the water a cornet fish come up and ate it, the odd thing about him was that a bigger fish had completely bitten its tail off but he could still manage to get around ok. Awesome electric blue on the fins!! On the last day I didn’t have much time so I just went for a quick fish and managed only one little lizard fish, it looked like the devil, I only used a couple of flies whilst in hawaii, The E.T marabou mantis pattern and a chilli pepper pattern.. you can check them out on the nervous water hawaii fly page here. 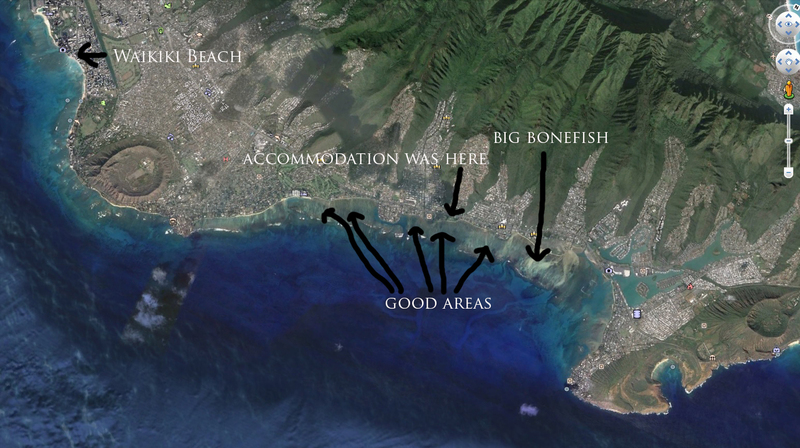 I only fished the flats between Diamond head and Koko head, the larger bonefish that I polaroided were 3kms north of my accommodation, see map. A few locations to check out. 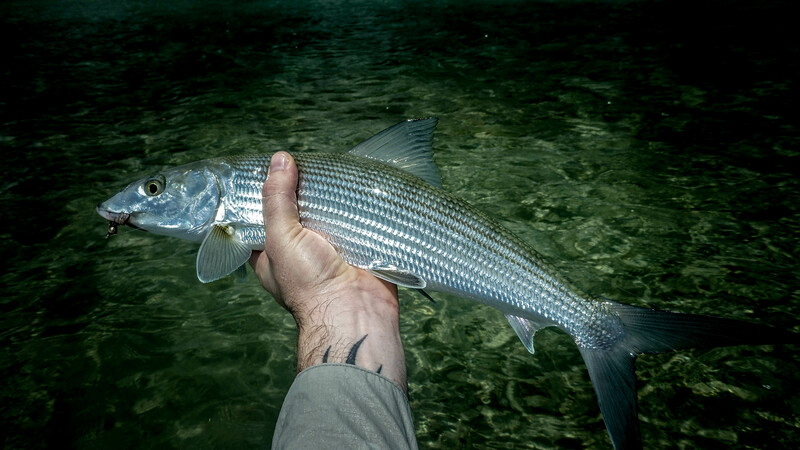 However there are many other options for bonefishing around Honolulu, if you hire a guide they will be able to get you to those spots, there are some good flats right near the airport but you need a boat to get to them, the flats near the airport have good numbers of exceptionally large bonefish up to and over 10lb. So if you are ever in Hawaii you should check it out, it will be well worth it! !